A high-ranking delegation of security cluster ministers has made a frank admission about solving political killings in KwaZulu-Natal: they are faced with enormous challenges. The delegation - made up of top officials including Police Minister Bheki Cele‚ State Security Minister Dipuo Letsatsi-Duba‚ Defence Minister Nosiviwe Mapisa-Nqakula‚ Justice Minister Michael Masutha‚ NPA head Shaun Abrahams‚ and national police commissioner General Kehla Sitole‚ - descended on the volatile province on Monday in a bid to solve rampant political slayings. The powerful delegation was in the province at the request of President Cyril Ramaphosa‚ who made the investigation into political killings an urgent priority following his visit to KZN last week in the wake of the murders of former ANC councilor Musawenkosi Maqatha Mchunu and IFP councillor Sibuyiselo Dlamini. The team is expected to give a preliminary report to Ramaphosa about their findings based on their meeting with the province’s top police brass‚ KwaZulu-Natal Premier Willies Mchunu‚ community safety and liaison MEC Mxolisi Kaunda and the team assigned to investigate the killings‚ which have continued unabated. But after a marathon meeting lasting several hours at the provincial police headquarters‚ it was clear that finding a solution would be a mammoth task. 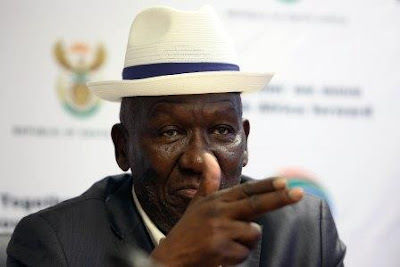 Cele told the media that due to certain technicalities they were not in a position to divulge what was discussed during the meeting as they still need to report back to Ramaphosa. “Today’s [meeting] comes from the instruction given by president last week...that security cluster ministers have to come here and deal with the matters of politically-related murders. We will be giving him a preliminary report‚” said Cele. Mapisa-Nqakula said after interacting with the multi-disciplinary team investigating political killings “it became clear to us that there has been enormous challenges” which had resulted in the inability to conclude investigations in some cases. “But as the [police] minister said earlier‚ most of these killings are politically motivated and they may be intra-party. However‚ we can only make that kind of statement when the investigation has been completed. “It’s clear that there are challenges that the team have. At times the witnesses themselves are reluctant to come forward and instances where witnesses have come forward‚ they change their statements later and they are intimidated into withdrawing those statements‚” she said. Letsatsi-Duba said they were concerned about coordination from the various clusters within the task teams investigating the political killings. “From those observations we need to understand why the delays in terms of arresting‚ in terms of prosecutions‚ in terms of containing witnesses so that they don’t disappear or they don’t become intimidated. “So politically there are these challenges which are very serious and‚ as the police minister indicated‚ we’re tempted to talk but we’re restricted because we must report to the boss first otherwise we will be fired‚” she said. Masutha lauded Ramaphosa for his decision to “pull us together in the manner that he did to look at these things collectively because it has been become abundantly clear that this is a situation where we cannot work in silos and hope to achieve the maximum outcomes”. He said that this coordination would also prevent “shifting of blame” over who had or hadn’t done their job. Masutha added that Monday’s meeting was not just a once-off engagement. Mchunu revealed that the Moerane Commission of Inquiry he set up to investigate political killings had requested an extension until the end of May to finalise its report. “We are still awaiting for a report. There was a request for an extension and that request was given until the end of May. We have an understanding that there will be no further extensions required because this was mainly for them to finalise their report. The ministerial task team will also have access to that report‚” said Mchunu.